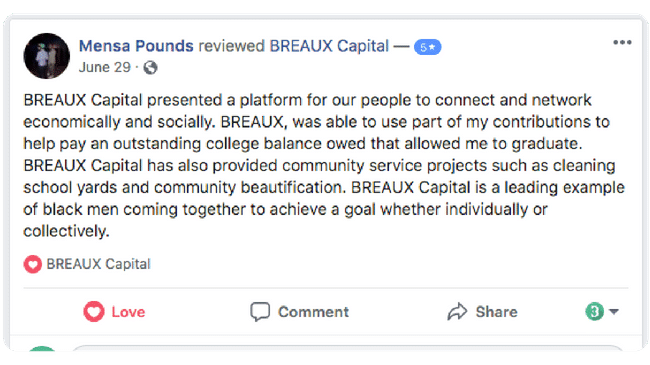 For less than the cost of a music or movie streaming subscription, you can begin the journey to getting your money right with BREAUX Capital. We are a network dedicated to personal and communal progress, but not everybody can rock with us. And that’s all good. We want quality over quantity. BREAUX Capital is for the elite, without the elitism. Is Automated Savings A Must? For BREAUX 100 members yes it is. For BREAUX Emeritus members it’s optional. Can I Change How Much I’m Saving? Our research shows $100 or roughly 25/week is a solid amount to set aside that will get you right. So the amount is set $50 every two weeks. Why Do I Have To Apply? Why Can’t I Just Join? We’re building something BIG here, so we’ve got to make sure that the people who are building it with us are tip-top, A-1, 100, so on and so on. It’s our responsibility to curate this membership network for the sake of adding the utmost value and eliminating or avoiding nonsense from our members’ user experience. What’s The Core Difference Between BREAUX Emeritus and BREAUX 100 Members? In the case of a liquidation event or an IPO, shareholding members would receive compensation. Also, shareholding members receive other benefits including access to targeted promotion of their personal and professional brands. Non-Shareholding Members can participate in the network and automate their savings, along with access to collective investment opportunities. 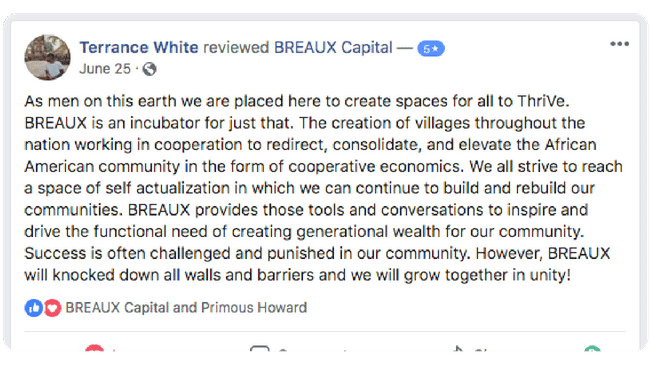 Is BREAUX Capital a Bank? We are the world’s first cooperatively owned and operated financial technology & services company operating a business model that primarily generates revenue from subscriptions. We are NOT a lender and we DO NOT make loans with cash deposits. We make money from direct-to-consumer membership subscriptions. Is BREAUX Capital an investment club? We are a cooperatively owned technology company operating a business model that primarily generates revenue from subscriptions. Our shareholders are also our clients and our clients are our shareholders. Our shareholders are also the operators, and our operators use the product. By synergizing, we all benefit, and so does the community. Is BREAUX Capital a Money Manager or Investment Firm? We are a cooperatively owned technology company operating a business model that primarily generates revenue from subscriptions. We have functional teams that fulfill the roles needed to run operations. We also have a board of directors who acts as a central body to make decisions regarding membership experiences and strategic planning. 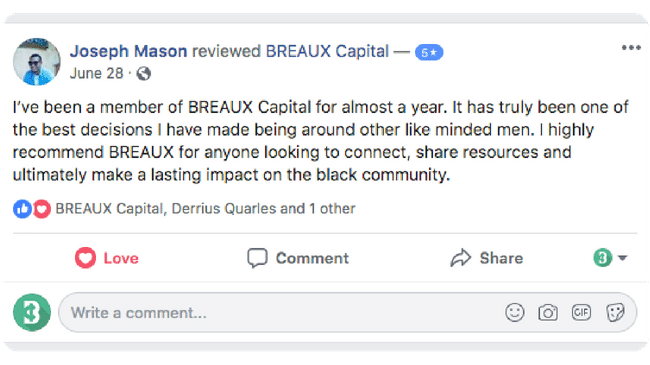 BREAUX Capital is a company with ever-increasing value. The price listed today may not be the price listed tomorrow. As our asset and capital pool of increases, the value extracted from the network will also increase. And on top of all of that, the issue we are solving is paramount so an incentive to join sooner than later is to let prospects know, the price will only go up from here. Our members are able to pull out their money without penalty after 6 months of membership. At this time, there are parameters around withdrawals that will be discussed after you apply here. 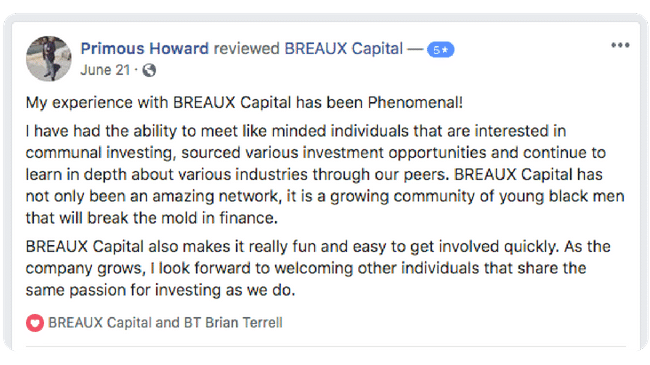 BREAUX is a business innovation that allows you to create a return on your investment by providing members a platform to automate savings, contribute to the membership network, and contribute to the operation of our company (if a shareholding member). Our product Innovation merging software and cultural community. People only bank with big name banks because they have to. We provide premium financial services to our members who don’t receive this type of love elsewhere Social Innovation in black men building a business utilizing a remote team structure. The first fintech company advancing the financial health of Black Millennials with social banking – a combination of software and community.